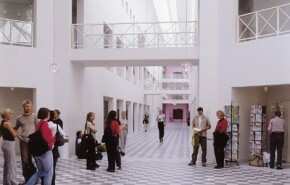 Copenhagen Business School has around 18,000 students and an annual intake of around 1,500 exchange students. With this number of students as well as around 550 full-time researchers and around 900 administrative employees, CBS is among the largest business schools in Europe. Copenhagen Business School is a private educational institution. It was established in 1917 by the Danish Society for the Advancement of Business Education (FUHU: Forening for Unge Handelsmænds Uddannelse). In 1965 the business school was integrated into the Danish education system as an institution of higher education. Today CBS is regulated by the Danish Universities Act of 2003. CBS has fifteen departments: Accounting & Auditing, Economics, Finance, Innovation & Organizational Economics, Informatics, Intercultural Communication & Management, International Culture & Communication Studies, International Economics & Management, International Language Studies & Computational Linguistics, Management, Politics & Philosophy, Marketing, Operations Management, Organization, Law, Strategic Management & Globalization and Business & Politics. The Business School has seven bachelor programmes and a growing portfolio of masters programmes taught through English. Copenhagen is lively and charming. The city has always been highly regarded, with its spectacular architecture, trend-setting designs and creative industries. The city has a mix of attractions including theatres, museums, castles, parks and sandy beaches. The well functioning public transportation infrastructure makes it possible for you to visit places and enjoy the rich culture of the Copenhagen area easily and at low costs. The youth culture in the city has a long reputation for being dynamic and energetic.